TripAdvisor review: “My son gave me this ride as a gift and I chose to use it on my daughter’s birthday. We had so much fun. Our driver, Craig, was prompt at the meeting point I requested. He took us to the great iconic sights in Sydney and gave us some info about them too. The bike is hard to miss but not overly loud so you can still chat as you go. I didn’t want to get off it was a brilliant treat. Highly recommend Troll Tours. Super easy to book and really reliable. Treat yourself you won’t regret it”. Rosemary organised the birthday trike ride Sydney for her friend Olivia. They drove in and parked at Blues Point so Craig picked them up there. They rode to Jeffery’s Wharf at Kirribili which takes you under the Sydney Harbour Bridge and past Luna Park. Then they drove across the Sydney Harbour Bridge to Woolloomooloo, Kings Cross and Mrs Macquarie’s Chair before driving back over the bridge. Craig dropped them back in Blues Point at their car. They had a great time! It was definitely one of the best birthday presents Olivia has ever received and one of the most memorable experiences! We will help you organise a fun adventure tour as a birthday present for someone. It can be a surprise or not. A trike tour is great for blind people! Adrian has a blast! He raved about the ride the whole day. We were discussing the weekend while waiting at the airport on Monday night and it melted my heart when he said the ride was the highlight of the weekend. Thank you! As for Craig he is an amazing person and an asset to the company. He was brilliant with Adrian, was not fazed by the fact he could not see, pointed outplaces of interest, chatted the whole time about what was around us, pointed out things like the abundant footy decorations ect. When we got back I would have loved to have given him a tip to go and have a beer or something on us, , sadly I did not have money on me 🙁 as I did not bring more than the room key and my phone with me on the ride. By all means use the photos and I will definitely post on social media. Once again thank you for helping to make our weekend special. A trike tour is great for blind people, it uses all their other senses. They can feel and hear the trike; the motion, the vibration, the roar of the motor. Heather organised the trike ride as a surprise for her blind son. Craig picked them up from their hotel in the Sydney before heading across the Sydney Harbour Bridge to Blues Point for a photo. They drove to Jeffrey’s Wharf, Kirribilli for more photos looking across the harbour to the Sydney Opera House. A quick look at Neutral Bay before heading back through the Harbor Tunnel. 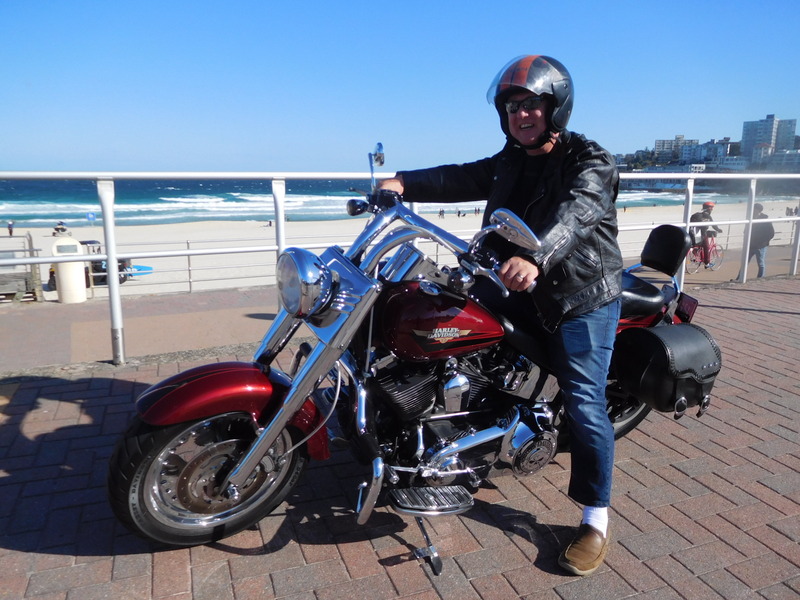 A present to Graham was a Harley ride through Sydney to Bondi Beach. Phil picked him up at the Rocks Markets and his whole family was there to see him go on his tour. They drove through Centennial Park, Bronte, Bondi, Rose Bay, Double Bay, Rushcutters Bay, Kings Cross, Woolloomooloo and back to The Rocks. Graham saw so much and loved every minute of it. Yea all good you can upload it. Overall good experience nice to talk with him and explain the sites. Our passengers are from Adelaide and in Sydney for a look around. At the last moment they decided to do a Harbour Bridge trike ride. Brian picked them up from their hotel, drove them over the Sydney Harbour Bridge and stopped at Blues Point for photos. They then did the loop around Kirribilli and back over bridge, through Mrs Macquarie’s Chair then dropped off back at their motel. As Anthony said; “Overall a good experience, nice to talk with him (trike rider) and explain the sites. Thanks again” Anthony. We do our best to accommodate last minute rides. It’s not always possible but we do our best to help you enjoy Sydney. 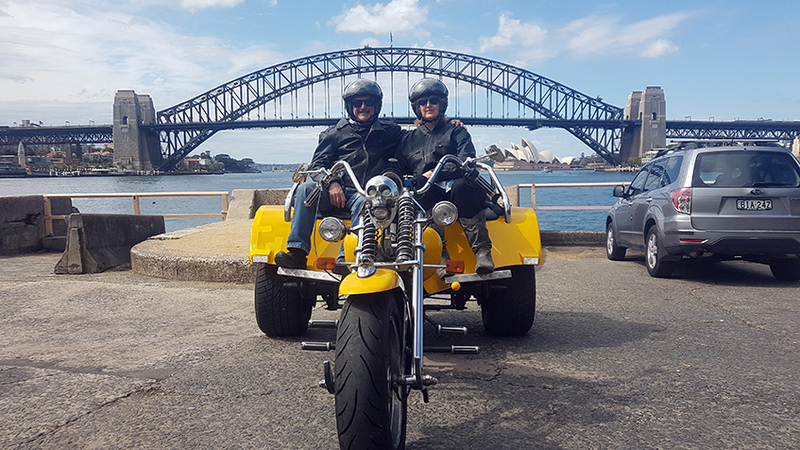 A trike or Harley ride is a great way to see and enjoy Sydney. 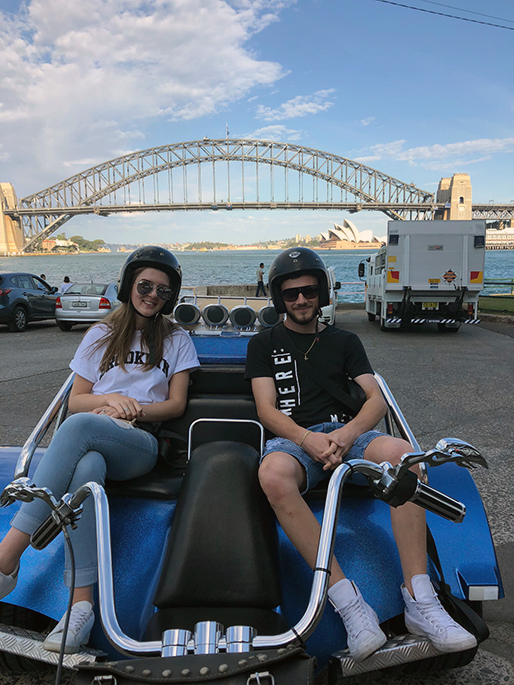 We were in Sydney for the weekend and had booked a Trike Tour for Saturday morning. Craig, our rider and guide, was great! He let us know all about the places we went and it was great fun. We would definitely recommend this to anyone wanting to do something a bit different. Our passengers wanted a trike ride for Sydney theatre event. Craig picked up Debbie & Elaine who where in Sydney to see Jersey Boys at the Capitol Theatre. They did the Eastern Panorama tour with a few changes. Craig drove them through Centennial Park then on to Coogee, Bronte and they stopped at Bondi Beach for a photo shoot and a stretch. Craig returned them to drop off point via Rose Bay and Double Bay. 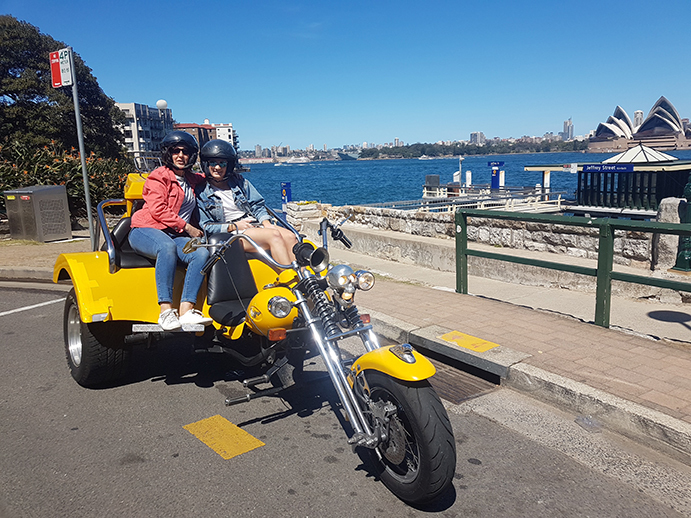 Debbie & Elaine had such a fun time experiencing the trike ride for Sydney theatre event that it has been decided they will do it again sometime! We love happy customers. If you are thinking about coming to Sydney for a trike ride for Sydney theatre event let us know. We will be very happy to show you our beautiful city and make your stay in Sydney even more fun! We had a great time cruising around the magnificent North Sydney shores with our driver, Craig. The booking process was easy and friendly and everything was setup on the day as previously discussed. I would recommend this trip to anyone who wants a special experience while discovering some of the best beaches in NSW. Thank you again to team Troll Tours! Thanks for reaching out. We had an amazing day and the weather was just perfect. Everything turned out as planned and yes Hajnalka had a great surprise. Craig was awesome. Jess and her wife had organised to have lunch in Manly and Jess thought it would be a lovely surprise to organise a trike to take them home. So after lunch they met Craig at the preorganised pick up place and he took them home via the scenic route. They did an adapted version of the North Shore Skimmer which included some very scenic views of the Pacific Ocean. Hajnalka did get a big surprise but it was a great surprise and a wonderful way to finish a relaxing and happy day. We have had a lot of experience creating surprises. 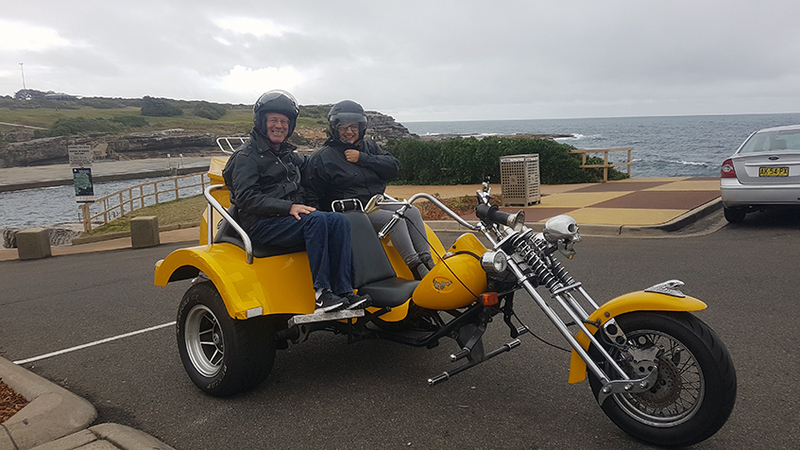 If you are thinking about organising a surprise trike ride transfer Manly, Bondi, anywhere in Sydney (including the outer suburbs) contact us for ideas. We can also pick up from home and drop off at the lunch, dinner or party. We enjoyed the ride very much thanks. We will be back, we would love one day to do the three bridges I think. So will be in touch. It was a great way for us to orient ourselves around the area and Craig was filled with information. It was a plus that the weather held off for us. Please do use a photo and thanks for sending them through to us. I have received them and could open the zip file okay. 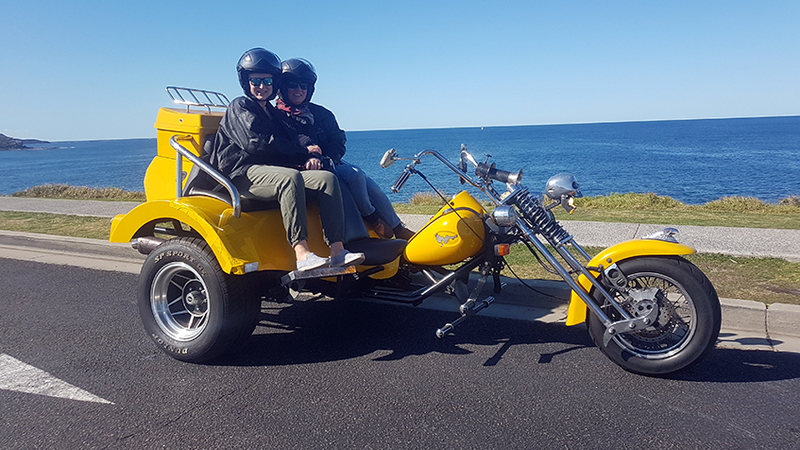 From New Zealand and in Sydney for a holiday, our passengers wanted to do a trike tour Bondi Beach and Watsons Bay and explore the rest of the Eastern Suburbs. 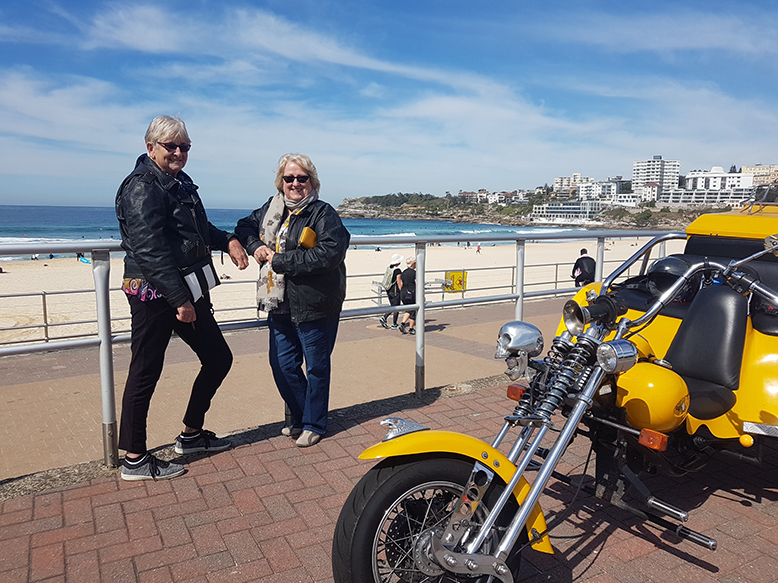 Craig picked them up in Bondi Junction and did the Eastern Panorama tour including Coogee, Clovelly, Bronte, Bondi, The Gap, Watsons Bay and Rose Bay. They saw some of the nice places in Sydney that have beautiful views over the Pacific Ocean. It was a cold and overcast day but that didn’t stop them and Craig from having fun while looking around. We do supply helmets and jackets though you are welcome to bring your own if you’d prefer. 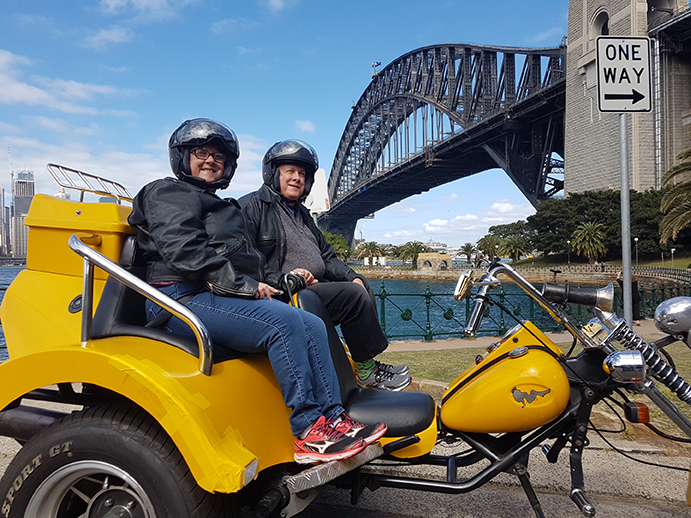 Whether you are a visitor from overseas or interstate or a local, our trike and Harley tours will show you interesting and different parts of Sydney. We did the three bridges ride, modified to cater for our particular interests. Right from the start Katrina was amazing, accommodating all of our requests for route modifications and the creation of an individualised gift certificate. Nothing seemed too much trouble. The ride itself was amazing. Craig, our tour rider did a great job, again accommodating all of our special requests. Sydney turned on a glorious morning for us weather wise. I would highly recommend troll tours for a unique look at Sydney from the back of a Harley trike. We had a great time on Friday. David had a blast. I have already written a TripAdvisor review. I’m not on facebook. We have no objection to the photos being put on social media. Kathryn bought David a Father’s Day Gift Voucher and at the same time organised the tour for today. They have done a trike ride with us before visiting Leichhardt in particular. David has a real interest in the early Italian settlement in the inner west of Sydney. Kathryn was happy to do another trike tour visiting places of interest but she wanted to see more. So we organised the 3 Bridges Ride adding Five Dock into the itinerary. David was stoked with his Gift Voucher and the ride, he has now seen another area that has been on his list. Craig picked them up from their hotel in the city, took the over the Sydney Harbour Bridge, through some of the north shore suburbs to the Gladesville Bridge. They rode over the Gladesville Bridge and then they turned off Victoria Road and headed into Five Dock. They had a look around and then headed over the wonderful ANZAC Bridge to drop off point. If you’d like to do a trike tour visiting places of interest we can easily work out an itinerary including them.